You want to apply for one of our master programs? Please read the explanation given below. If you have any further questions, please do not hesitate to contact us. As we have a rolling application process, applications can be submitted throughout the whole year. However, for an intake in the same year we recommend to submit the application until July, especially if a visa is required. Upon receipt of your application, a confirmation will be sent. Your documents will then be reviewed by the admissions office and if approved, you will receive suggestions regarding the day and time of the interview. One of the directors of the master program you applied for will interview you for 30 minutes at the HECTOR School or via the phone. After a positive evaluation, another 30-minute interview will take place at the HECTOR School or over the phone, in which the managing director of the HECTOR School will ask you for your motivation and possible further development. Based on your application documents and the HECTOR School interviews, and in accordance with the admissions regulations, the admissions committee will decide on an internal ranking of the applicants. Immediately after the meeting of the admissions committee, you will receive a status report confirming your successful application. 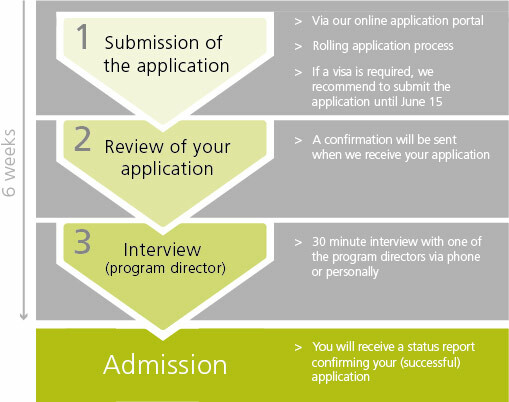 Altogether, the process from receiving your application until the final decision of admission is completed within 6 weeks.